As per the Roadmap for Testing an WebService's Authorization Model and What is the formula for the WebServices Authentication mappings? 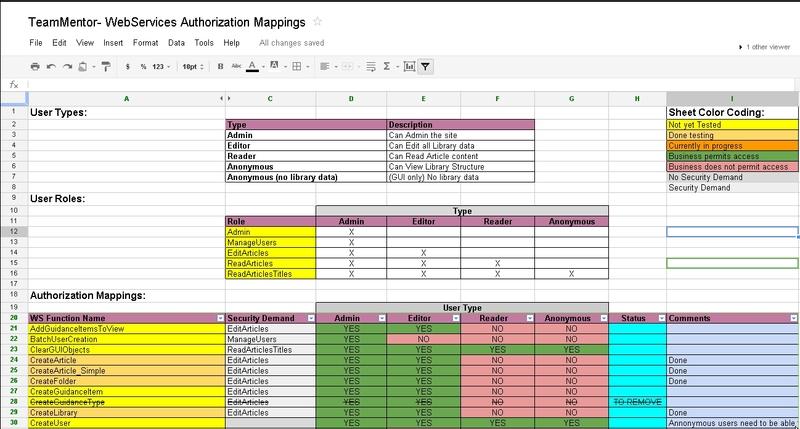 One of the assets that we need is the official mapping of TeamMentor's WebServices Authorization Rules. This is the mapping according to the 'Business Logic', and must be independent from what actually is happening at the live website (and within the code). 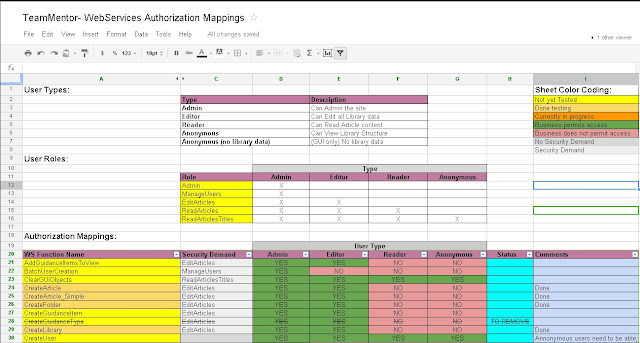 Our current solution is to have a shared GoogleDoc spreadsheet which these mappings. These mappings represent what is expected to happen, so for example if one of the methods marked with NO (in light red) can be invoked by that type of user (like an Reader), then that is a vulnerability. Basically what we are asking them is: Tell me how you expect your app to behave, so that I can tell you what actually happens. These mappings are the key to the discovery of security issues and (in their absence) to provide assurance to the business that the application is behaving the way it should.